You've heard of the Goodreads Challenge. I participate every year (but this may only be my third year--can't recall), but I do wish Goodreads tracked a category for books readers attempted but abandoned. You can only delete them or mark them as "read." The former might lead to you trying the same lousy book again, as middle-aged forgetfulness creeps up on you, and the latter just isn't true. All of which to say is, I "read" 125+ books last year, completing my challenge, but at least five of those were dumped books, and by "dumped" I mean I gave up usually before I hit the 5% mark. Anyhow, I signed up for the Goodreads Challenge again in 2017 but thought I'd add my own variation to it and invite any of you to come along. Welcome to....the Bestseller Puzzle Reading Challenge!!! This Christmas I gave my youngest a puzzle, which we worked on together. 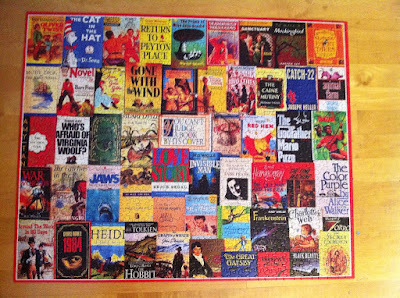 Very fun puzzle, and fascinating to see how many bestsellers I'd never read. Historically speaking, not every bestseller turns into a classic, but seeing which stand the test of time is too tempting to resist. Black Beauty by Anna Sewell, because, at this stage in the game, you need a freebie, and you already read this one at #22. So there you have it! How many can you cross off, right off the bat? I've got 32 of 53 out of the way, which is the ideal way to start off a reading challenge, and the next BPRC book loaded on my Kindle is Erich Segal's Love Story. Whee! I've read 28 of them. I notice it's heavily weighted towards recent books. Maybe that's because it's a bestseller list. I highly recommend "Black Beauty." It's actually not a children's book; it was written to protest the way horses were treated at the time. I'm also clocking in at 32. Fun list! Some I've always meant to read, but haven't. Now's the time! Hooray! Really, you beat me, because I counted THE CAINE MUTINY, and I only read that just yesterday, before I decided to do the challenge!!! I've read 40 on the list and am intrigued by what I haven't read. My public school education was better than most, and we had to make a least one book report per month. I usually handed in 2 or more. I devoured the list from Jr. High on. We didn't have TV, books were a form of entertainment.